Total existing-home sales, which are completed transactions that include single–family homes, townhomes, condominiums and co–ops, declined 3.3 percent to a seasonally adjusted annual rate of 5.04 million in April from an upwardly revised 5.21 million in March. Despite the monthly decline, sales have increased year–over–year for seven consecutive months and are still 6.1 percent above a year ago. The problem does not appear to be a sign of housing market weakness however. Lawrence Yun, NAR chief economist, says sales in April failed to keep pace with the robust gain seen in March. “April’s setback is the result of lagging supply relative to demand and the upward pressure it’s putting on prices,” he said. Total housing inventory at the end of April increased 10.0 percent to 2.21 million existing homes available for sale, but is still 0.9 percent below a year ago (2.23 million). Unsold inventory is at a 5.3–month supply at the current sales pace, up from 4.6 months in March. 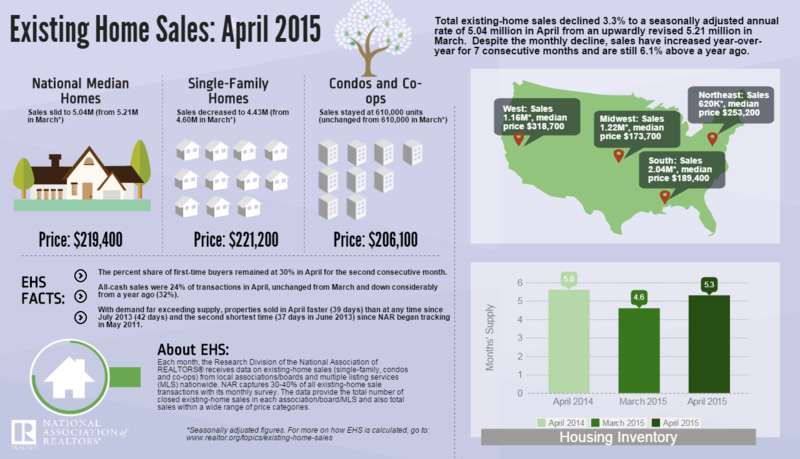 The median existing–home price for all housing types in April was $219,400, which is 8.9 percent above April 2014. This marks the 38th consecutive month of year–over–year price gains and is the largest since January 2014 (10.1 percent). With demand far exceeding supply, properties sold in April faster (39 days) than at any time since July 2013 (42 days) and the second shortest time (37 days in June 2013) since NAR began tracking in May 2011. “Housing inventory declined from last year and supply in many markets is very tight, which in turn is leading to bidding wars, faster price growth and properties selling at a quicker pace,” says Yun. We could be in for a bit of relief with housing inventory issues. Numbers on “housing starts” have shown very strong for the past few months. Construction started on new U.S. homes sprang up 20.2% in April to a seasonally adjusted annual rate of 1.14 million. That’s the biggest monthly percentage gain in more than 24 years and the highest level since November 2007, the U.S. Commerce Department reported. Starts for single-family homes rose 16.7% to an annual rate of 733,000, the fastest pace since early 2008, while starts in buildings with at least five units jumped 31.9% to a pace of 389,000. Short sales were on the market the longest at a median of 180 days in April, while foreclosures sold in 50 days and non–distressed homes took 38 days. Nearly half (46 percent) of homes sold in April were on the market for less than a month. Speaking of low interest rates According to Freddie Mac, the average rate for a 30–year, conventional, fixed–rate mortgage remained below 4.00 percent for the fifth straight month, falling in April to 3.67 percent from 3.77 percent in March. Northeast – down 3.1 percent to an annual rate of 620,000, but are 1.6 percent above a year ago. The median price in the Northeast was $253,200, which is 3.6 percent higher than April 2014. Midwest – up 1.7 percent to an annual rate of 1.22 million in April, and are 13.0 percent above April 2014. The median price in the Midwest was $173,700, up 11.4 percent from a year ago. South – declined 6.8 percent to an annual rate of 2.04 million in April, but are still 3.6 percent above April 2014. The median price in the South was $189,400, up 8.5 percent from a year ago. West – decreased 1.7 percent to an annual rate of 1.16 million in April, but are still 6.4 percent above a year ago. The median price in the West was $318,700, which is 10.0 percent above April 2014. Despite the existing home sales data hiccup, everything continues to point to a very strong summer for home sales. If, of course, builders can keep the market satisfied with fresh inventory.